As long time residents in cottage country, we saw a need for helping clients design and create a waterfront that is both functional and visually pleasing while maintaining the natural shoreline that this beautiful area is known for. With a passion for boating and all things water related, Northshore Waterfront Solutions was created. Our specialty is in custom-designed boat lifts to integrate into a new or existing structure. With over 40 years experience designing and building homes, cottages and boathouses, David owns David Robson and Associates – a custom designer builder and brings a wealth knowledge to Northshore Waterfront Solutions. David graduated from Ryerson Polytechnical Institute with a diploma in Architectural Technology and has owned/managed marina and boat businesses throughout his career. David has been working on the water his entire career and spends his time enjoying the lake and all it has to offer. Integral to Northshore's commitment, David creates design concepts and ensures a seamless transition to new or existing structures on your property. With a diploma in architectural technology from Fanshawe College, Kent leads the planning and implementation of your custom design from the conceptual stage through construction and after sales-service to ensure you are 100% satisfied. Kent has over 9 years experience in waterfront property development specializing in cottage country. Growing up on the water, Kent has a passion for design, boating and water sports and this is truly exemplified in his work. With a degree of Bachelor of Commerce from McMaster University, Kim has over 9 years experience in retail management and product and retail marketing. Kim has a passion for business and brand development, but also craves the cottage country lifestyle that she grew up with. Her commitment to client service has been a constant priority throughout her career. 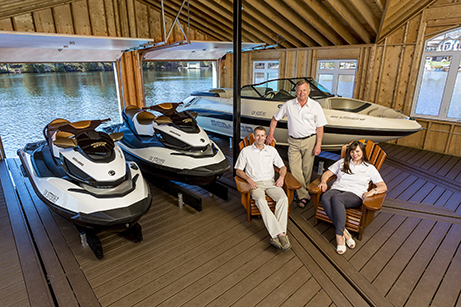 Similar passions for being on the water and the cottage country lifestyle are what drew David, Kent and Kim together to create Northshore Waterfront Solutions.